My shadow weave sampler strip is finally off the loom. I say finally, because it seemed to take an awfully long time to weave. 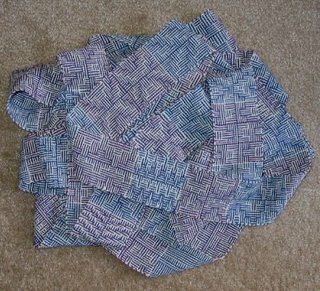 I wasn’t sure of the best way to photograph all ten yards, so it ended up in a pile. Close ups plus yarn and weaving details can be found in this post. My weaving width was a fraction shy of 3 inches (46 ends sett at 16 epi). Fresh off the loom the strip measured 2 & 5/8 inches wide by 9 yards 5 inches in long. I might have been able to eek out a few more inches, but I finally had one thread break close to the end of the warp, and so just wove it off. The yarn, Knit Picks lace weight merino at 4141 yards per pound, proved to make a sturdy warp. After wet finishing and steaming, it measured 2 & 1/2 inches by 8 & 2/3 yards. Next will come some experimenting with lengths of this. And even though I’m curious to see how they will look sewn together lengthwise, I have to admit that mostly, I'm just glad to have it off the loom! I know the feeling of being glad to get something off the loom that has just gone on too long! Though I also know hating to get something off the loom because I have either enjoyed weaving it so much or I wish desperately for more warp to experiment with. I thought the photo quite neat! Leigh, I love the shadow weave. I just can't get over how the colours play with each other in this weaver. I did a very similar pattern using 2/20 silk in bright purple and yellow. And it had this most wonderful natural brown, difficult to describe, vibrant colour. Will you use your sample for something. Wow Karen, purple and yellow are a brave combination (to me!!) I'm hoping to cut and sew the strips together to create a vest or perhaps a cardigan. It will take a lot of mental energy on my part, so I doubt I will have anything to show for it very soon.